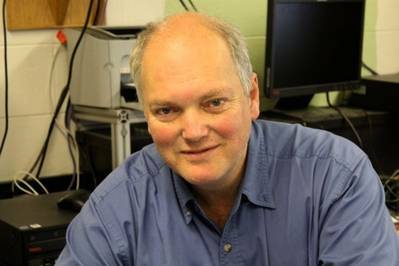 Maine Maritime Academy (MMA) apprises that faculty member, Dr. George Harakas, has co-authored a patent with colleague and business partner, Scott Eaton, for glycerol-containing fuel aimed at reducing emissions in large diesel engines. The two are members of the SeaChange Group LLC a private company formed in 2009 to develop low-emissions fuels. They recently received notice from the U.S. Patent and Trademark Office that patent # 8,679,202 was formally issued. The Academy explains that SeaChange Group (SCG), headquartered in Brunswick, is an entrepreneurial high-tech start-up with strong ties to Maine Maritime Academy. The company is developing Eco-Hybrid fuel technology, a low-cost, low-emissions “drop-in” fuel for marine, rail and power-generation industries. SCG has received funding from the Department of Energy, the National Science Foundation, the Maine Technology Institute, and seed money from industry. “I did not envision that a patent would come out of this research, which began as a capstone project,” said Dr. Harakas, who teaches general chemistry and chemistry for engineers at Maine Maritime Academy. “The interdisciplinary collaboration between engineering and chemistry is key to taking the research projects from the laboratory into the field.” Dr. Harakas earned his Ph.D. in Inorganic Chemistry at Texas Tech University. He is also Co-Principal Investigator on the Department of Transportation / UTC grant which is funding METEL, the Marine Engine Testing and Emissions Laboratory, at Maine Maritime. Caterpillar Marine announced the development of new technology solutions for European Union (EU) inland waterway (IWW) vessels.